A bogus letter under Gov. Jay Inslee’s name is spreading fake news the old-fashioned way — on paper, taped to doors, one reader at a time. VANCOUVER — On Thursday morning, Gary Berreth stepped outside his house and found an unexpected letter attached to his front door. The letter featured the Washington state seal and claimed to be from the Office of the Governor. It warned of “an adjustment in property taxes” due to the shutdown of an oil terminal and an agreement with BNSF Railway to prohibit the shipping of oil, lumber and coal by rail through Vancouver. At the end of the letter was a carefully scrawled signature: “Jay Inslee,” Washington’s Democratic governor. Copied on the letter were Clark County Assessor Peter Van Nortwick and Treasurer Doug Lasher. “I instantly knew that there is no way the government does business like this,” said Berreth, who said he saw the same letter attached to other doors throughout his Green Meadows neighborhood. Berreth was correct in assuming the letter was a hoax. In an era of growing concerns of fake news spreading online, these apparent dirty tricksters have taken up a more old-fashioned approach to spreading misinformation. Simon Vila, spokesman for Inslee, confirmed that neither the governor nor his staff were out posting notes to residents’ doors. “This is definitely not from our office,” he said. Vila noted that the fonts of both letters are similar. Lasher, a Democrat, said that the letter’s claim that the governor has authorized an adjustment to property taxes is false. “If they knew the law, they would know that’s incorrect,” said Lasher. 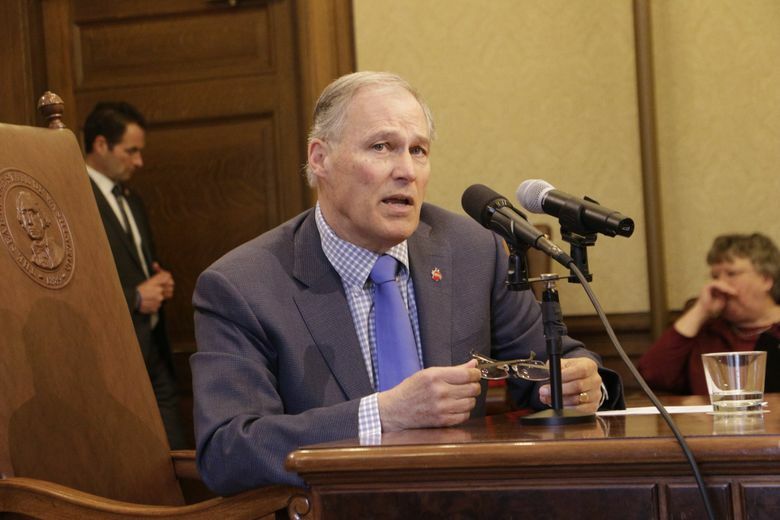 The letter’s reference to “shutting down the oil terminal” is a likely reference to Inslee’s decision earlier this year to reject a proposed crude-by-rail terminal at the Port of Vancouver. The letter’s claim that BNSF, which operates a large network of railways, has entered an agreement to end the shipment of oil, lumber and coal by rail through Vancouver is also highly questionable. “I’m just surprised someone took the time to write something like this up,” said Van Nortwick, a Republican. He took to Facebook to debunk the letter, although pointed out that not all of it was fake news.